Apple News+ is a subscription service for people who crave a greater variety of content than they get through the free Apple News app. It’s Apple’s way of letting you get the “good stuff” of journalism—the features are normally locked behind magazine subscriptions or (in a few but notable cases) paywalled daily news sites—without forcing you to plunk down hundreds of dollars in subscription fees. Instead, you’ll just pay a modest price to Apple. Below you’ll find answers to some of the biggest questions you might have about the service. Apple News+ is a new subscription-based addition to the existing Apple News app for iOS and macOS. While the free Apple News app largely emphasizes “straight” news, Apple News+ emphasizes longer-tailed magazine content, although you’ll also get access to content from sites like The Wall Street Journal and The Los Angeles Times that would normally be behind paywalls. Some magazines in Apple News+ have nifty features like animated “live covers” that enhance the magazine-reading experience for the digital age, but a surprising number of magazines on Apple News+ are little more than PDFs. How do I sign up for Apple News+? First, make sure you have at least iOS 12.2 installed on your iPhone or iPad. You’ll then find the Apple News+ tab along the bottom bar when you open your regular Apple News+ app. Press on it and you’ll see a splash page with a red tab that says “Try It Free.” Press that tab and enter your Apple ID and you’ll be in immediately. An Apple News+ subscription costs $9.99 per month, although you can try it out for free for a month when you first sign up with your iPhone, iPad, or Mac. Keep in mind, though, that Apple will automatically start charging you once the free month is up. If I cancel my free trial early, can I keep using Apple News+ until my free month is up? No. Apple News+ will deny you access to the articles via the app the second you unsubscribe from the service. If you want to get the most out of the trial before making a decision, use Siri to set up a reminder to cancel a day or two before the subscription is set to renew. Which magazines are included in Apple News+? You can find the full list on the next page. What countries is Apple News+ available in? Currently, just the United States and Canada. There’s actually a decent selection of Canadian publications, ranging from The Toronto Star to L’actualité. How do I search for a specific magazine? Apple News+ doesn’t have a traditional search bar on iOS (although you'll find something of the sort to the left of the interface on a Mac), so this isn’t as intuitive as it could be. Instead, Apple wants you to browse (think: newsstands) so you need to open the Apple News+ tab and then click on either of the Browse the Catalog tabs along the top and scroll down to the magazine you’d like to read. Alternatively, you can press on the topical tabs to the right of the Browse the Catalog tabs, which cover everything from Entertainment to Science & Tech. There’s an easier way to search for specific magazines, but it’s even less intuitive. First, press the Following tab at the bottom of the Apple News interface. (It’s next to the Apple News+ tab.) Then enter the name of the magazine you want to find in the “Channels, Topics, and Stories” search bar that appears at the top of the next screen. Once the magazine’s name pops up (if it’s available, of course), press on the name of the publication to see its latest issues and articles. How to I add magazines to my favorites/My Magazines? This is basically the same as the steps mention above but with a twist. Go to the Apple News+ tab and press either the Browse the Catalog tabs or the topical tabs at the top. Scroll to the magazine you want to add to your favorites and press the cover. In the new screen that pops up that shows all the issues and articles, press the name of the magazine at the top of the display. In the new menu that pops up, press the heart icon to favorite it. We’ll really like you if you do. Alternatively, press the Following tab at the bottom of the Apple News interface. Enter the name of the magazine you’d like to favorite in the “Channels, Topics, and Stories” search bar at the top. When you see the name of the magazine pop up in the search results, press the heart icon to the right to favorite it. How do I read articles from The Wall Street Journal, The Los Angeles Times, and other paywalled news sites? There’s a good chance that you won’t even have to add them to your favorites in order to see their content, though, as the landing page for Apple News+ includes default sections for From the Wall Street Journal and From the Los Angeles Times. At the time of writing, the full list of such sites includes The Wall Street Journal, The Los Angeles Times, The Star, The Skimm, The Highlight by Vox, Vulture, Grub Street, The Cut, and TechCrunch. How do I search for specific articles? The only real way to find a specific article is to go to the issue you know it’s in and scroll down to the article’s link. And if the magazine is just a PDF? Well, get ready to browse the table of contents in the PDF. 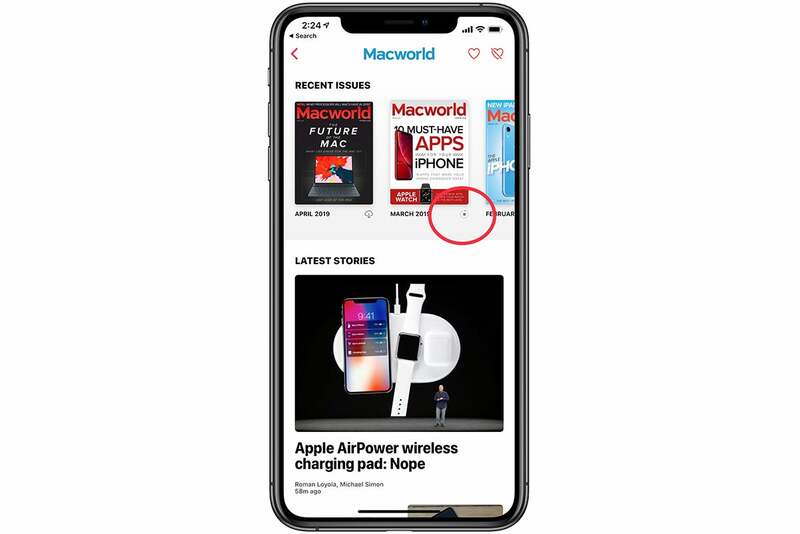 Is Macworld available through Apple News+? Yes, it is! You can find our digital magazine by either scrolling to Macworld under the Browse the Catalog (A-M) tab or under the Science & Tech tab. How do I download a magazine for offline reading? If you’ve favorited a magazine, its current issue will automatically download to your device. 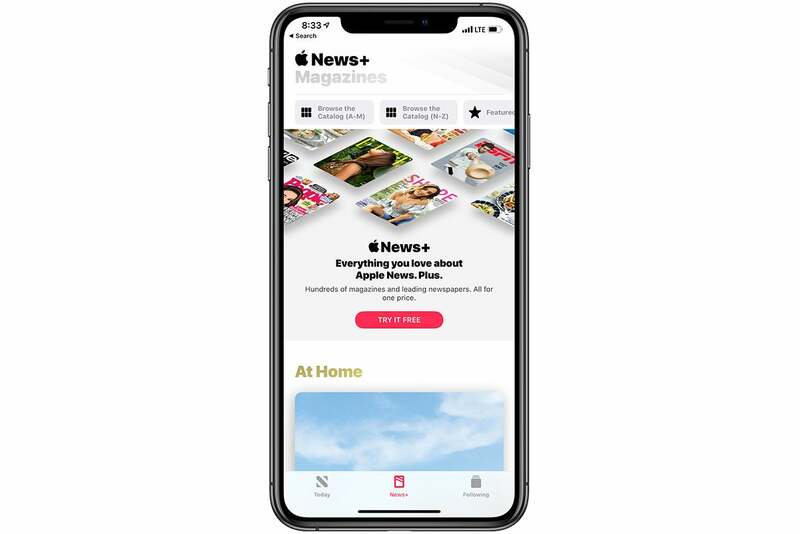 For any other magazine, open the Apple News+ tab and then browse for a magazine through the Browse the Catalog tabs or select one from your My Magazines section. At almost any point where you see a magazine cover, you’ll also see the download symbol (a cloud with a downward-pointing arrow). Press it, and the issue will immediately start downloading. You’ll also find all your download magazines under the My Magazines header when you open Apple News+. How do I delete downloaded magazines? 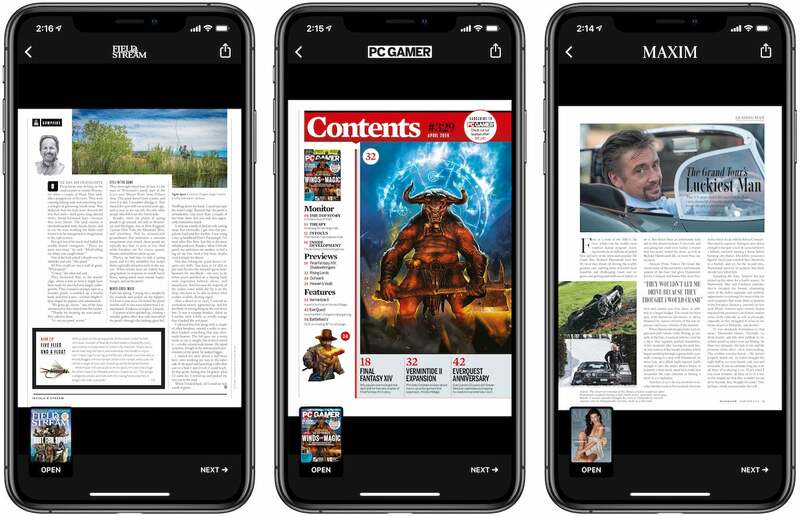 And if think your storage space is limited, I’d put a lot of thought into whether or not you want the latest issue of National Geographic on your iPhone. Keep in mind that Apple also doesn’t even tell you the file sizes of issues. 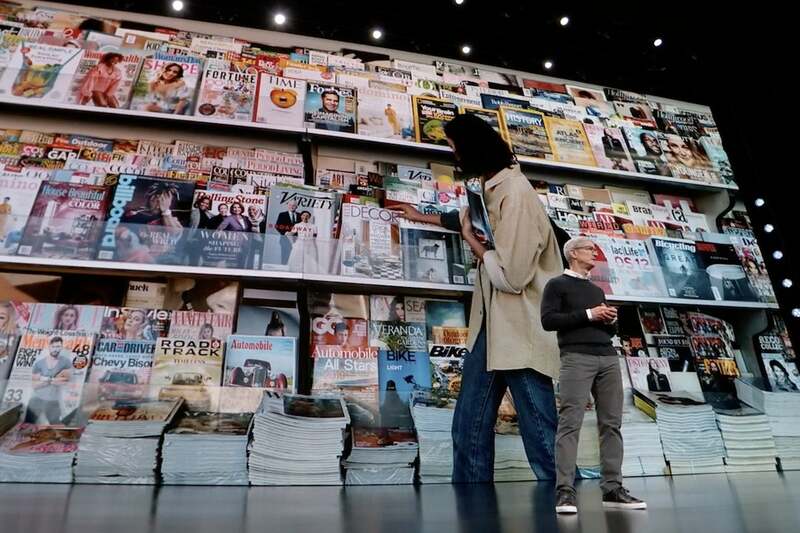 How many magazines are available on Apple News+? 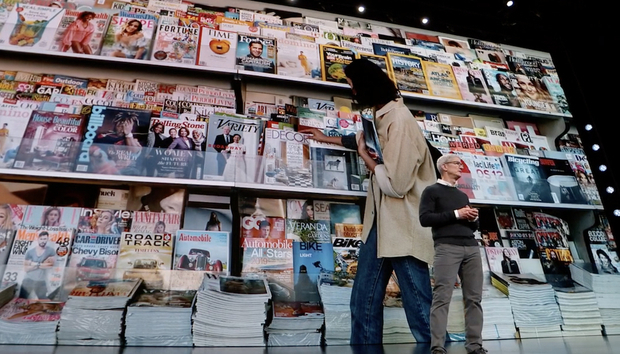 At the time of writing, Apple says you can read more than 300 publications with an Apple News+ subscription. If you actually count them out, though, there’s only around 250 visible through the Browse the Catalog tabs. We’ll likely see more appear soon, considering that the app just launched. Also, keep in mind that Apple doesn’t include paywalled content from sites like The Wall Street Journal and The Washington Post in Browse the Catalog section. You can find the full list of magazines on the following page. Does Apple News+ mean I can drop my subscriptions to publications included in Apple News+? It depends on how often you use that publication and how you use it. Take The Wall Street Journal. A subscription normally costs $39 a month, and an Apple News+ subscription is a good way to avoid that punch. Thing is, you’re not getting all the WSJ’s content with Apple News+. You’re just getting a carefully curated sample. If you just want to read the Journal casually, though, Apple News+ is a great option. It also depends on how you typically read your news. I, for instance, have a New Yorker subscription, but I typically visit the site through links on Twitter instead of visiting the site directly. Clicking a link on Twitter isn’t going to make Apple News+ open, though, so I’ll still trigger the paywall and monthly article limit. Unless I start reading the New Yorker exclusively on Apple News+, I see no real reason to give up my subscription. That said, I plan to use Apple News+ for National Geographic, a magazine I’ve long admired but not enough to pay for. Do all magazines in Apple News+ have the “live covers” and similar features Apple showed off on stage? No. So far the magazines that offer live covers are few and far between, and they’re typically the publications with massive budgets. (They’re also usually the ones that show up as “Suggested” when you browse by magazine topic.) Many publications are properly formatted for Apple News+ (such as Macworld), which generally means you’ll get table of contents for each issue and and links to individual articles. Zooming in helps when you’re looking at a PDF, but it’s still kind of awkward. At least it’s a good way to appreciate the work that goes into page design. In many cases, though, you can only get PDFs of the magazines. Notable examples include Field & Stream, Maxim, and PC Gamer (above). You’re basically looking at the magazine as you would when you pick it up at a newsstand. This is fine on an iPad and tolerable on an iPhone XS Max, but if you’re on a smaller iPhone, you might find the experience poor enough to warrant skipping the subscription. How do I share articles from Apple News+? In theory, all you need to do is press the Share tab in the upper right and then tap Copy. That will give you an Apple News+ link you can paste into Twitter, Facebook, or whatever. Unfortunately, I’ve noticed that these links don’t always work—sometimes even when I click on them from the same device. For best results, open the article on the publication’s homepage where possible by pressing the Share button, then sidescrolling along the bottom until you see Open in Safari. (You may have to add it via the More tab at the end.) Press it, and you’ll see the page open with a normal URL that will work no matter where you paste it. Can Android and PC users read links I share from the Apple News+ app? Yes, even if you link directly from Apple News+, it should open like a regular link in their preferred browser. How do I cancel Apple News+? Cancelling a subscription to any Apple service used to be a pain, but now all you need to do is go to the App Store app, press on your profile photo in the upper right-hand corner, and then press Manage Subscriptions. Then you’ll press Apple News+ and tap Cancel Subscription. You can check out our how-to article and video for more detailed information. Here’s the full list of magazines that you’re currently find in Apple News +.